Beguni are a deliciously simple Bangladeshi fritter associated with monsoon season in the country. This recipe allows you to create the fried aubergine slices at home, made extra-crisp thanks to rice flour and spiced with cumin, chilli and turmeric. For more authentic Bangladeshi recipes, take a look at Dina's other recipes here. Rainy weather always calls for something crispy and fried, reminiscent of monsoon season in Bangladesh. This tradition is rooted all across the Indian subcontinent, where large batches of fritters are a regular occurrence and accompany afternoon or morning nasta, or tea. Family and friends gather along verandas, beside windows and on balconies to enjoy crispy morsels while watching the torrential rain. Beguni are one of my favourite Bangladeshi fritters; dangerously moreish and very easy to make. Popular during Ramadan meals, they sit alongside a rice and lentil dish called kichuri and when Ramadan is over, they become a rainy weather essential. 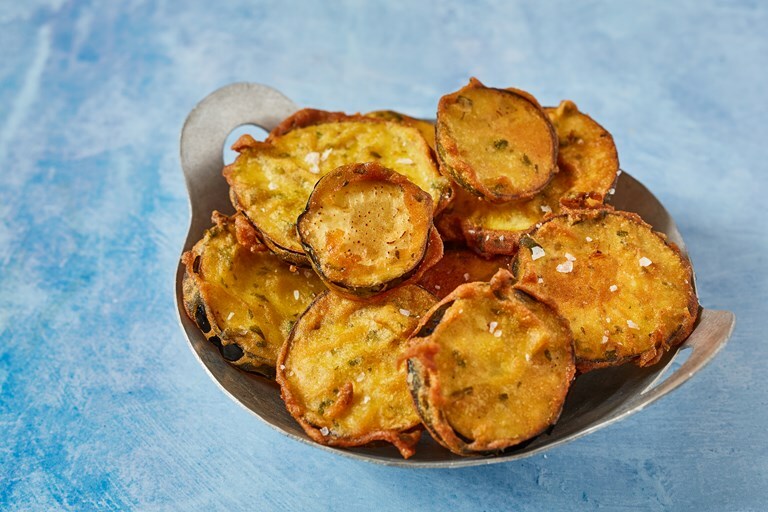 A light, spiced tempura-like batter coats thin slices of aubergine and is fried on high and then low heat for an extra crispy exterior and a soft interior. Dina Begum a cookbook author and writer who is passionate about highlighting the recipes and food traditions of Bangladesh.